Battery Vermont (1861-1865) - A Union U.S. Civil War gun battery established early in 1861 in Northwest Washington DC. Named Battery Vermont in G.O. 18, 30 Sep 1861, presumably after the State of Vermont. Battery abandoned in 1865 at the end of the war. Established early in 1861 with emplacements for three 32 pounder seacoast cannons. Battery Vermont was constructed before the Virginia shore of the Potomac was occupied by Union troops. It had a good view of the Leesburg turnpike. 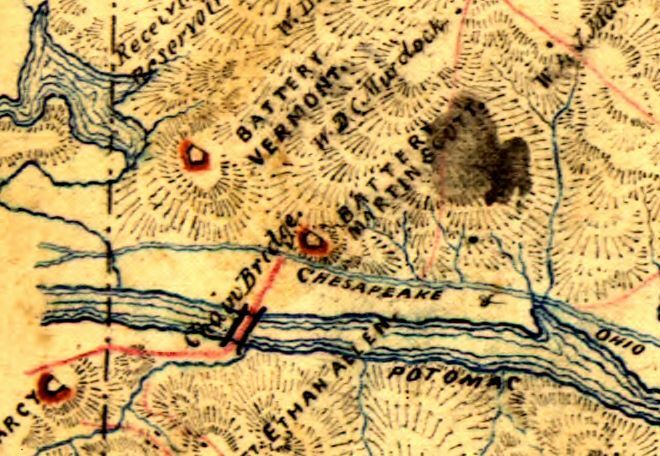 In December 1863 a Commission recommend the substitution of rifled guns for the 32 pounders, to bear on Leesburg turnpike but by 1964 that had not happened. A 17 May 1864 report from the Union Inspector of Artillery noted the following: "Battery Vermont, Lieut. George Rollins.–Garrison, one company First Maine Heavy Artillery– 1 commissioned officer, 1 ordnance-sergeant, 27 men. Armament, three 32-pounders. Magazines, one; not dry; wants repairs. Ammunition, full supply and serviceable. Implements, complete and serviceable. Drill in artillery, fair. Discipline, fair. Garrison is sufficient."